Stress is becoming a major concern as the pace of life continues to accelerate augmented by the constant connectivity provided by ICT. The Workplace Health Association of Australia’s (WHAA’s) 2015 report on the Australian workforce has shown that 65% of employees reported moderate to high stress levels, with 41% having psychological distress levels considered to be ‘at-risk’ (WHAA, June 2015). 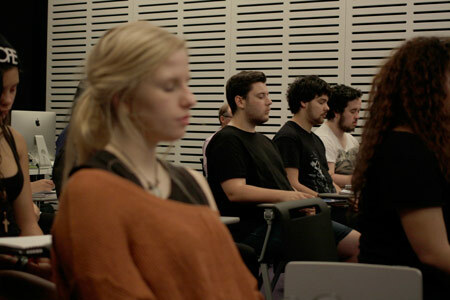 Stress and anxiety is also a concern for students with, for example, the UNSW Student Wellbeing Survey, 2013, showing that UNSW students reported moderate to extremely severe levels of symptom expression for depression 27%, anxiety 31% and stress 21% (CAPS, UNSW, 2014). I would imagine these sorts of figures are similar across Australia and possibly many parts of the Western world. The Anxiety and Depression Association of America (ADAA), for example reports that forty million American adults suffer from an anxiety disorder. They also claim that anxiety disorders are one of the most common mental health problems on college campuses (http://www.adaa.org/finding-help/helping-others/college-students/facts, p. 1). The growing need to address issues of chronic stress, time poverty, information overload, fragmented attention and constant partial attention (CPA), both in and outside of educational settings, has led many people to contemplative practices such as meditation and yoga. These ancient practices are entering the mainstream as the numbers seeking the relief they can provide increase. 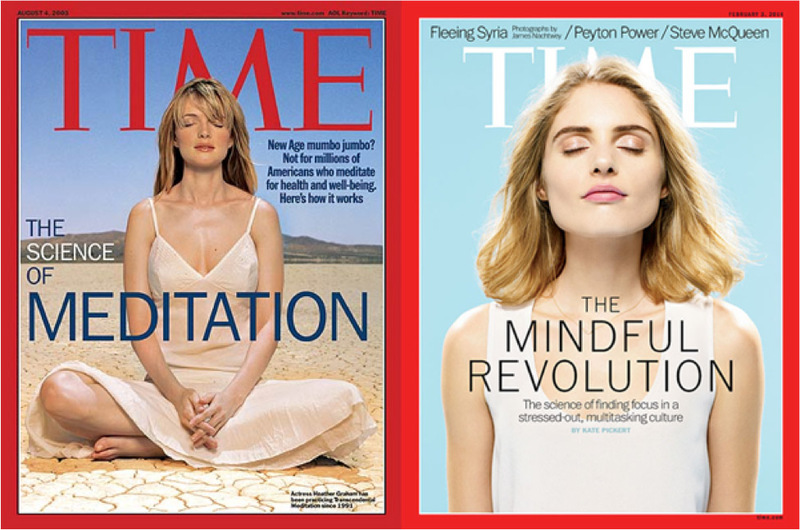 In tracing this increase - in 2003 Time Magazine dedicated its front page to ‘The Science of Meditation’ and 11 years later in 2014 its cover heralded the ‘Mindful Revolution’ with 2014 being described as the ‘year of mindful living’. The interest in contemplative practices in the West, frequently derived from, but not limited to Buddhism and Hinduism, can arguably be said to have started in 1840 with the introduction of Buddhism to the United States through Chinese immigration (The US many not be representative of all Western countries but it provides a useful reference). This was followed by visits to the US by Hindu and Buddhist sages starting with Swami Vivekananda in 1893. Other stages in this history, include investigation of the Wisdom Traditions by members of the counter cultures of the 1960s and those of the New Age movement in the 1970s. Contemplative practices were further integrated and normalized from the 1970s with John Kabat-Zinn’s development of Mindfulness Based Stress and Pain Reduction (MBSR), the increasing popularity of Yoga, interest in holistic health and the growing numbers of celebrities speaking openly about their contemplative practices. These include Steve Jobs, Clint Eastwood, David Lynch, Richard Gere and Oprah Winfrey. This has led to or accompanied the integration of contemplative practices in many fields including, medicine, sport, business, and relevant here, education. In addition, interest in brain plasticity and a particular plasticity associated with meditation that has been confirmed by Neuroscience in recent years, has validated the field of Contemplative Education. There is now 40 years of Neuroscience and meditation research, much of which focuses on the frontal cortex and the heightened executive function that can arise from meditation and other contemplative practices. In addition, a number of popular books written by Neuroscientists such as the Buddha’s Brain by Dr Rick Hanson are supporting the upsurge of interest in integrating contemplative practice in individual’s daily lives and in business and educational settings.